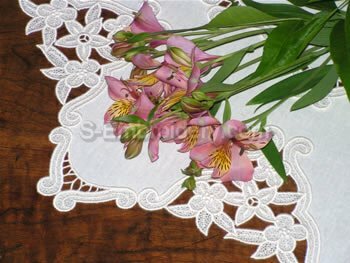 The set includes 2 elegant free standing lace machine embroidery designs. 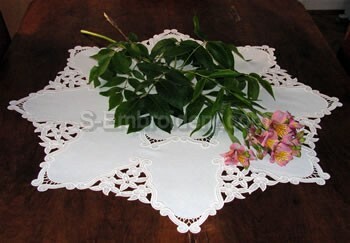 Using them in combination with fabric will let you create a fine freestanding lace doily or a whole table cloth. You are not limited in the size of your lace embroidery project. All you have to do is stitch out enough lace pieces. 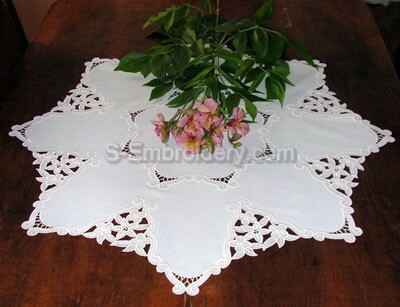 The doily featured on our site (scroll down for pictures) has a diameter of 31 inches (79 cm) and was created using 8 of the large and 16 of the small freestanding lace machine embroidery designs. The designs will fit in 5 x 7 (130 x 180 mm) hoops.